Today we're sharing an excerpt from Six Month Rule by A.J. Pine! Enjoy! Taurus: Hold fast to your single-minded nature today--no matter how long her legs or how lush her red lips. Gemini: You were a shining star last night, but reality can be a real--well, you get the picture. Just remember: Tall, dark, and British equals no corner office for you. “May I…?” he asked, his voice hoarse and expectant as he raised a palm toward one of her breasts. 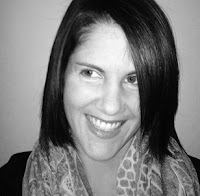 She half smiled while biting her lip, then nodded, and Will brought his hand to her skin. As he made contact, they each drew in a sharp breath. “Say it again,” she whispered, her hands clasping around his neck. “God, Holly?” he asked, teasing, because he knew what she meant, but he wanted her to say it one more time. He brought his lips to hers, not yet a kiss, but close enough to feel her breath on his skin. One hand was still on her breast, and the other had found its way to her back. Will was barely hanging on, but he wanted to do this right, put someone else’s needs first, give her what she wanted. He kissed her, featherlight, and she spoke softly against him. His lips moved to her jaw and her neck, and all the while he spoke sweetly against her. He felt her swallow as he peppered her skin with tiny kisses, and again he heard her voice, faint yet insistent. She gasped and rocked her hips against him, and he took that as a yes. God, it had been so long since he’d been with anyone like this, and the way she responded to him was enough to drive him mad. He knew this was dangerous ground, that he wasn’t just attracted to Holly physically. He should be logical here, weigh the pros and cons, but her hands had left his neck and found the button of his jeans, and that was it. Will finally put his overactive brain to rest. It was all instinct from here, because Holly Chandler responded to his impulses, and he to hers. Will scooped her into his arms and dropped her over the side of the sofa so she now lay on her back. Holly yelped with laughter as he stepped around to meet her, sitting on the edge of a cushion. 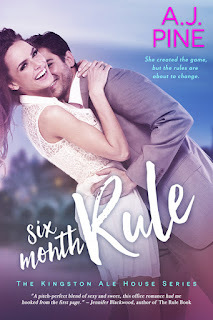 Six Month Rule by A.J. Pine is a contemporary romance, released by Entangled Publishing on July 11, 2016.